3 Reasons to Color & a Color Guide – Plus a HUGE giveaway! Have you taken up coloring yet? 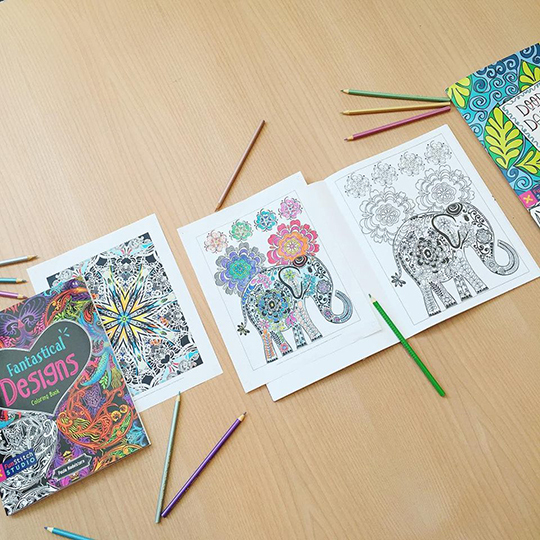 It seems like the entire world has been caught up in the coloring book craze lately, with adults from all over rediscovering one of the joys of childhood–and realizing it has tons of grown-up benefits too, from relieving stress to promoting creativity. 1. Color for your mental health: While exercise is great for your physical (and mental) health, coloring requires your brain to engage both the right and left sides. That's because coloring is both creative and logical. 2. Color to create something beautiful: Coloring books take the guesswork out of creating a beautiful masterpiece because the layout is done for you. But the best part is using your creativity to pick out your colors and decide how to make the layout come to life. 3. Color to create unique wall art: Creating something that is one-of-a-kind is one of the best feelings. Hanging that coloring book page framed on your wall is a great way to reap the benefits of your work. You can get in on the fun with C&T's line of six coloring books with designs by some of the most admired quilting, sewing, and fabric artists: Piece O' Cake Designs, Paula Nadelstern, Bethany Pease Sheets, Valori Wells, Patty Young, and Geta Grama. Plus, coming in October, we're starting a line of coloring books with more complex, intricate designs aimed at those who want to take their coloring to the next level. You can pre-order Modern Elegance and Off the Bookshelf now! The best part about our coloring books (aside from the gorgeous designs, of course)? All pages are printed one-sided, on high-quality paper, so you can easily frame your creations! -Cool colors such as blue, green, and purple are calming. -Warm colors such as red, orange, and yellow are radiant and uplifting. -Pastel colors such as light shades are soothing. C&T staff took a little time to de-stress and color–you can see some of our creations above (colored with Faber-Castell colored pencils)! One lucky reader of today's post will win THREE coloring books– Playful Designs, Boho Designs, and Fantastical Designs–plus TWO packs of Faber-Castell colored pencils–12 Metallic Colored EcoPencils and 24 GRIP Colored EcoPencils. You can enter the giveaway here: a Rafflecopter giveaway. Have you taken up coloring yet? What do you love about it?